Hopscotch Films makes international feature documentaries and drama from Scotland. WOMEN MAKE FILM premiered recently at the Venice Film Festival and at TIFF – previously John Archer produced Mark Cousins’ THE STORY OF FILM (TIFF 2011) I AM BELFAST and ATOMIC: LIVING IN DREAD AND PROMISE, screened with Mogwai performing the soundtrack live 40 times around the world. Recently Scottish-BAFTA nominated ACCIDENTAL ANARCHIST (Directors John Archer, Clara Glynn) premiered at CPH:DOX and ARCADIA (Director Paul Wright) at the BFI London Film Festival. Current projects include MAKE ME UP, Scottish artist Rachel Maclean’s technicoloured dystopian fiction about being female in a consumer society, which premieres at the BFI London Film Festival; HARRY BIRRELL (director Matt Pinder) one man’s life – and the twentieth century - captured in home movies; and DO NO HARM (director Steven Bennett) a shocking expose of Western government’s love affair with torture. A creative leader with considerable experience in film and television production, setting up successful new ventures and spotting and developing new talent. He was head of Music and Arts at BBC Scotland and the founding Chief Executive of Scottish Screen. John Archer is the producer of the feature documentaries Women Make Film, The Story of Film (Peabody Award 2014), Alasdair Gray: A Life in Progress, I Am Belfast, Atomic: Living in Dread and Promise, Arcadia, Make Me Up and Executive Producer of the film drama The Carer. He co-directed and produced the documentary Accidental Anarchist (2017). John has produced and executive produced over 600 hours of UK network television. He is Managing Director of Hopscotch Films producing both drama and documentaries. He has won both UK and Scottish BAFTAs and the Festival Prize from Florence’s Festival dei Popoli. He is Chair of Independent Producers Scotland. 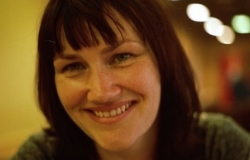 Clara Glynn is a writer/director with extensive experience in drama and documentary production. Clara is Executive Producer of Hopscotch Films productions Women Make Film, Make Me Up, Glasgow Love and Apartheid and Eminent Monster. She is also an award winning television director her work ranges from the feature length documentaries Accidental Anarchist (Storyville); I Met Adolf Eichmann (BBC2); The Stuarts and A History of Scotland (BBC); The Hidden Jews of Berlin and Love Sick (Channel 4). Her drama directing includes Channel 4’s No Angels and BBC’s New Street Law. Her prize winning short films have been screened at festivals including Edinburgh, Berlin, New York, Los Angeles, Rome and Barcelona. Clara writes a returning legal series for Radio 4 Behind Closed Doors. She’s written a libretto Hagar in the Wilderness for composer Sally Beamish and a theatre play Safe Place for Oran Mor/The Traverse. Carolynne produces Drama for Hopscotch Films and is currently running the Scottish Shorts scheme with Digicult and producing Rachel Maclean's newest art film Make Me Up. Most recently, Carolynne has produced two of Greg Hemphill's comedy-horrors: Long Night at Blackstone and West Skerra Light. Carolynne started life as a production manager on leisure series such as The Big Country for the BBC and Ride On for Channel 4, but has for the past 14 years been concentrating on fiction, via short films, features and tv drama. As a producer, her short films have screened at festivals throughout the world and won many awards including a Special Jury Prize at the Cannes Film Festival for Daddy's Girl. Her TV dramas have played to both critical and popular acclaim, as well as winning many awards and nominations throughout Europe, including the Prix Italia and the Rose D’Or. She has worked as a line producer on several low budget HD features, and as associate producer and script editor on The Acid House written by Irvine Welsh and directed by Paul McGuigan. Carolynne produced two of Joern Utkilen’s short films, Little Red Hoodie and Asylum, both for Film 4 and is currently working with co-producer Matthieu de Braconier on Joern’s first feature film, again with Film 4. Her first credit as a radio producer came in 2011 with the comedy series Ruby for Radio Scotland, written by Sanjeev Kohli and Donald Mcleary. This last credit had a nice circular feel to it, taking Carolynne back to her youth when she was a trainee at Moray Firth Radio in Inverness, singing jingles and presenting a show containing lots of dark, difficult and depressing goth music. She is now a much happier person. Charlotte Wontner has worked extensively across drama and documentary in film and television as a producer and in development. She has immense experience of running a budget and organising large productions and has had success selling and promoting her films at festivals throughout the world. Recently Charlotte has produced the feature film THE CARER starring Brian Cox, Emilia Fox and Anna Chancellor (Cinefile UK/Corinth USA) which premiered at the Edinburgh International Film Festival and the Palm Springs International Film Festival. It won ‘best of the fest’ at both festivals and was nominated for the Scottish BAFTA’s and the Hungarian Film Awards. Her other features include ISLAND starring Colin Morgan, Janet McTeer and Natalie Press (Soda UK/Anderson USA), the $4million horror THE SICK HOUSE starring Gina Philips (Arclight/Warners) and the Indian co-productions 16mm comedy STRAIGHT and the 3D horror FIRED. In 2004 Charlotte produced Clio Barnard's film/art Installation about Gypsy life ROAD RACE which was commissioned by Film London. Since setting up Hopscotch Films with Clara Glynn she has produced the shorts IT’S NOT YOU, IT’S ME which was short-listed for BAFTA and nominated for the Turner Classic Movie Awards 2001; the 35mm shorts SHRINK and A FAIRY STORY which was selected for "Critics Week" at the Cannes Film Festival, runner up at the Kodak Short Film Showcase Awards 2002 and short-listed for the Academy Awards. Charlotte's documentary work includes the C4 series Naked News, C4’s Equinox God Only Knows, the BBC2 Modern Times The Partners, the BBC1 Omnibus Dancing Through Darkness. She production managed Clara Glynn's four part series for BBC2 Alan Clark's History Of The Tory Party and then went on to Associate Produce Clara's film Last Years Tories for C4's Cutting Edge.